Hello Friends of Minesing Wetlands. 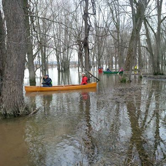 FOMW will be leading a fall paddle through the Minesing Wetlands on October 3, 2015. There is limited space on this trip. The cost is $20 for members and $40 for non-members. We will meet and depart at the Willow Creek Canoe Coral on George Johnson Road (Cty Rd 28) and take out at the Edenvale Conservation Area. Plan to meet at Willow Creek Coral no later than 8:30 am. The trip will take approx. 5 hours. At least a basic paddling know-how is required for this trip. All boats must be equipped with the required safety equipment (life jackets, bailer, whistle, light and throw rope). Dress appropriately for the weather conditions of the day. Also, bring extra clothing in case you get wet. Bring your own warm drinks and snacks for along the way, and a packed lunch for our break around noon. Categories: Friends, Paddle, Tour, Trip | Tags: canoe trip, Minesing Wetlands, paddle | Permalink.